Candles are our favorite go-to when looking for items that can do double-duty in an interior. Not only are they perfect for adding a special a scented glow and a little ambiance to a space, in unique containers, candles are also great decorative objects that can add to a room’s decor. 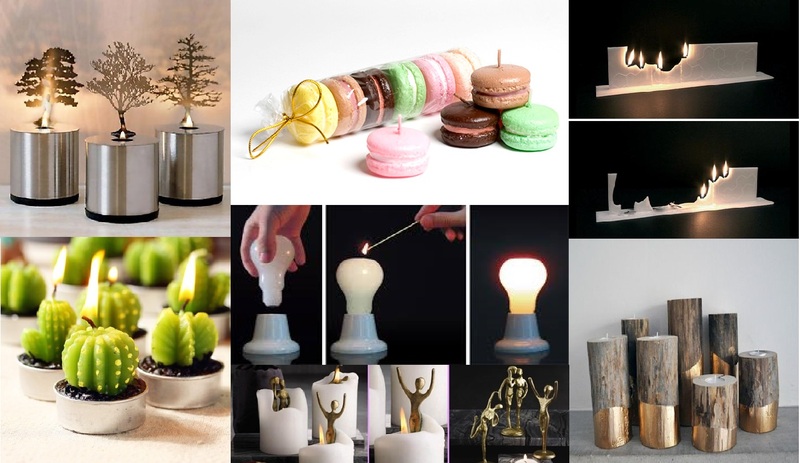 Here are a few of our favorite candles that are sure to add a decorative touch to your space. West Elm’s Pineapple Scented Candle is in a holder that you’ll want to keep long after the wick has died down. Crafted from ceramic with a gold-stemmed lid, this tropical candle looks great when standing alone on a shelf or grouped among a few votives. In this Nesting Doll Scented Candles collection, each of these forest animals can be opened to reveal the scent of your choice. The ceramic collection, which comes in balsam and cedar, balsam and spice, red holly berry and cabin in the woods, reveals scents with a sweet, woodsy outdoor smell. How about a candle with a light-hearted quotable? This Escape The Ordinary scented candle from Kate Spade is sure to do the trick. In a black and white polka dot container, this soy blend, white willow scented candle is a great reminder to go beyond the ordinary every day. This beautiful House of Harlow Candle Trio Gift Set in black and gold is so fashion forward. In notes of bright jasmine and tea, pink peppercorns and carnation, and bergamot with coconut milk, this set will have your home smelling absolutely delicious. Made in New York, the Trust Your Dopeness candle is a fun way to bring some hip style home. Pure soy wax burns beautifully with a soft fragrance in a classic matte black container. The two-wick Gilded Amberleaf Trinket Box Ceramic is a beautiful little treasure that will absolutely shine on a mantel or on the coffee table. With a radiant scent of rich amber, cedarwood, vanilla and tobacco, this warm candle will have you thinking of cool and cozy winter nights. Zaha Hadid Design’s Prime Oriental Large Scented Candle is a blend of soy and paraffin wax poured into a skeletal-like bone china vessel. With notes of orange, sandalwood and fig, this complex scent is absolutely stunning in this uniquely crafted statement piece.